The Vein Clinic is one of the very few centres in the UK where radiofrequency perforator ablation is performed and taught to on a regular basis. 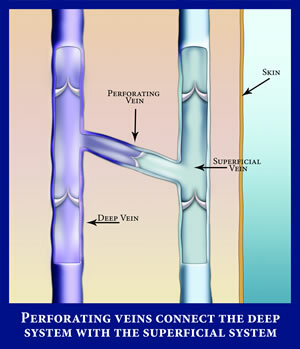 Perforating veins are short connections between the deep and superficial veins of the legs. They are like the rungs of a ladder connecting the two long poles together. We all have these connections between our venous systems and ordinarily they do not present a source of problems. What problems do perforating veins cause? Perforating veins cause two types of problem. Firstly, they have been associated with chronic skin changes and leg ulcers. It is estimated that 2 out of every 3 patients with skin changes secondary to chronic venous insufficiency will have a component of perforator reflux in addition to superficial or deep venous reflux. Perforating veins are also responsible for some patterns of recurrence after previous surgery for varicose veins usually stripping. This does not mean that these patients have a higher risk of leg ulceration. Should perforating veins be treated? The evidence for perforating veins and their link with ulcers is an exciting new field. The majority of this research is concerned with the traditional subfascial endoscopic perforator surgery (SEPS) as described below. There is strong evidence that surgical removal of abnormal perforators reduces the recurrence rate of venous ulceration. Perforating veins associated with recurrent varicose veins are not usually treated with SEPS due to the limitations and costs of the procedure. This has changed with the arrival of the radiofrequency perforator treatments. The SEPS procedure requires a major anaesthetic. At the start of the procedure blood is drained from the leg. A small cut is made in the calf, and the surgeon passes a special balloon into the calf which is then inflated so it makes this space wider. The perforator veins lie across the space and the surgeon either clips them off. Patients usually return home within 24 hours although the procedure itself is quite painful afterwards. Complications of the procedure include wound infection, bleeding, nerve damage and deep vein thrombosis. The RFPA procedure is performed under a local anaesthetic as a minimally invasive, day-case procedure. Using ultrasound guidance a fine needle is passed into the perforating vein through the skin. The radiofrequency current heats the inside of the perforator causing it to shrink down and remove the abnormal flow between the deep and varicose veins. The whole process takes approximately 16-20 minutes per perforating vein. Cosmetic appearances are superior to the SEPS procedure with hardly any scarring and patients usually report little or no pain afterwards. Complications include deep vein thrombosis and nerve damage causing numbness. Only about 1% of cases of numbness become permanent. Over 15,000 procedures have been performed worldwide with closure rates that average 70% to 93%.. 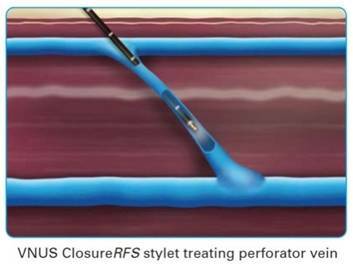 The radiofrequency stylet is the only such device cleared by the FDA in America for the treatment of incompetent perforating veins.